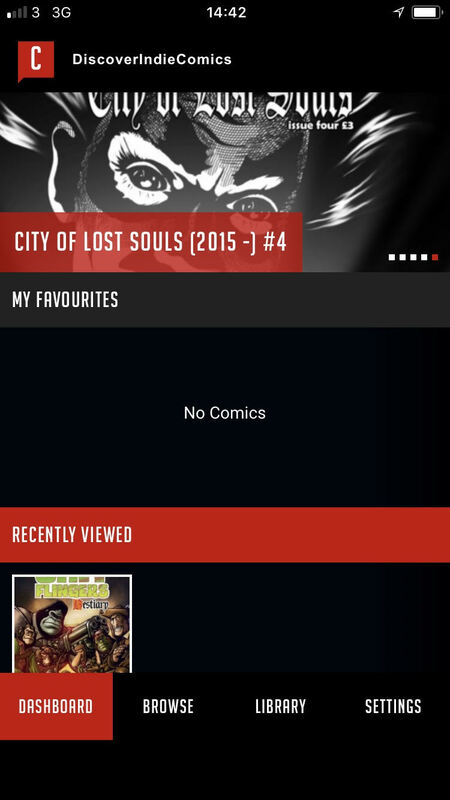 So I’m one of the lucky few that was given advance use of the new, dare I say ground-breaking, app from Comichaus. I was pre-warned in my lovely email that it’s not 100% complete and bug free yet but should be by the time it gets released for public consumption. To make me sound like I know what I’m talking about - The version I’m testing is for the iOS users amongst us so any points, good or bad, I find are from my experience with this particular app. 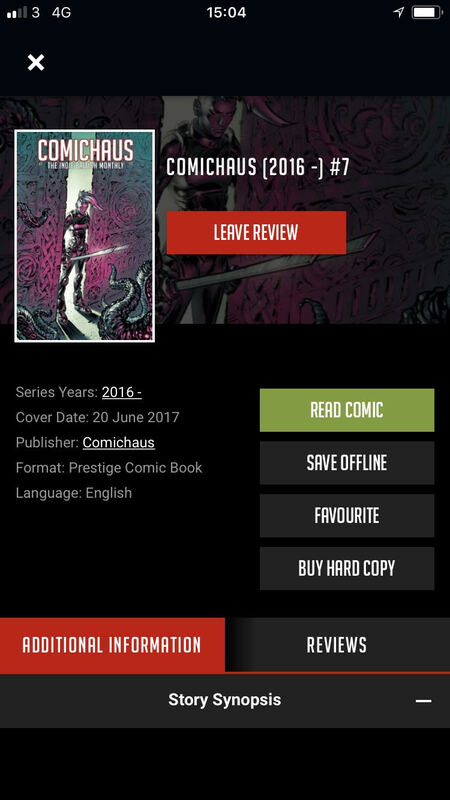 I know not whether the Android version will be different or the same but since Comichaus never do anything half-arsed I’ll presume that it’s the same level of quality for all platforms. Why are TheDreamCage reviewing something tech related? Well, I think the more important question is why did this fall on the desk of a middle aged man allergic to change but, in truth, we wouldn’t normally review an application from anyone. This one however is huge and genuinely has the chance to change the face of comics consumption in the way Netflix changed television and film. The app downloaded in a matter of seconds from the App Store on my iPhone 7, the choice of communication device I rely on the most and straight away I’m in the dashboard. 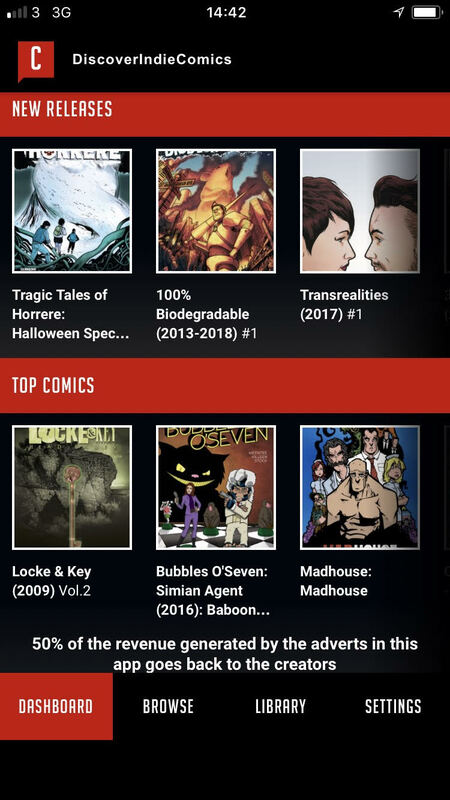 At the top of this homepage is a slide show of top titles you can easily link to, below a space for comics you add to your favourites list, the titles you’ve viewed recently, a grand selection of new titles you can swipe through and the bottom of the homepage a choice of top comics. 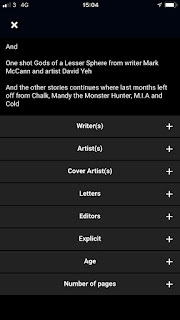 On my first switch on of the app the titles ranged from release dates spanning about 6 years so for someone like me who is new to enjoying comics, the thought of an archive... well quite honestly I’m aroused. A nice note from Comichaus stating 50% of all advert revenue goes to the creators of the fine books I’m about to dive into means the pop up ads, that to be fair are small and unobtrusive anyway, don’t bother me like maybe they do on other apps (IMDb I’m looking at you!). Then your hard bar choices at the base of the page are there to be pressed. The search parameters that’s where they hide the gold. It’s also the place other sites and apps lose me as a user. Searching HAS TO BE EASY and you’d be surprised how many people get this part of their product wrong. 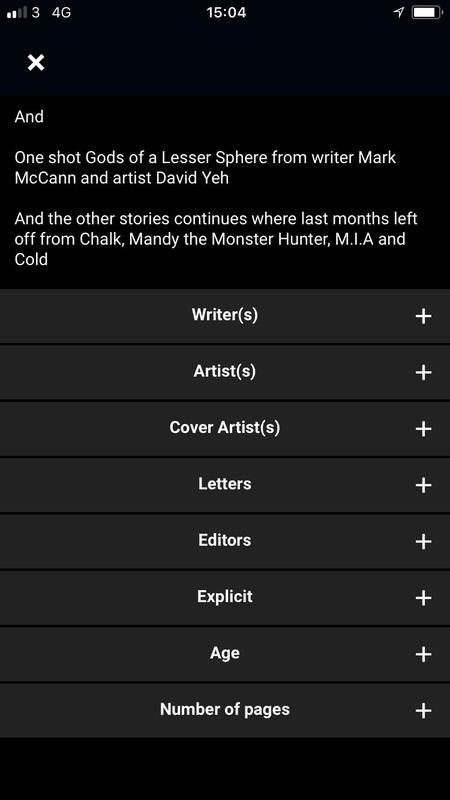 With the Comichaus app you can tell this is where all their RND budget went. Hit Browse and then I’m confronted with logical choices, logical I tells thee! Sort by title? No problem. 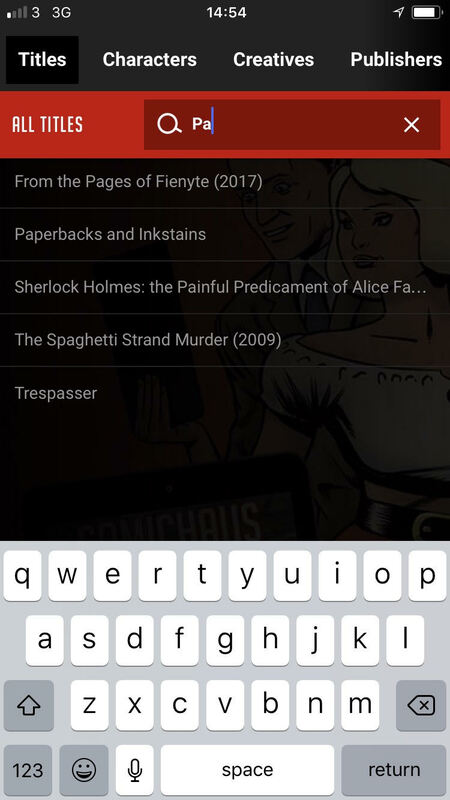 A list of every title on the app is there in numerical and alphabetical order but if want a particular title start writing it in the search bar et voila. This photo was me starting to look for Papercuts and Inkstains (the collected version is what's available at the moment hence Paperbacks instead of cuts) from Madius Comics as that’s the brand I’m most familiar with. As you can see I got as far as ‘pa’ before the app shortened the list for my stubby thumbs to press. The same principle applies for characters from a particular comic, the creators you might want to find, genres, and publishers. In fact it’s so simple I’m now wandering what the catch is? Why is this easy? Nothings ever easy in technology. You can play through all the options to your hearts content and each time you press something you get delivered to a page of wonders. I went for creators - Robin Jones, because who doesn’t love Rob? 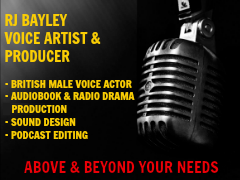 And that brings up his profile page with his ugly mug at the top with website and Twitter link followed by a pictorial menu of all the titles he’s been linked with either in writer or letterer capacity. This brings me to the beauty of the app, the comics and how simple it is to read one. 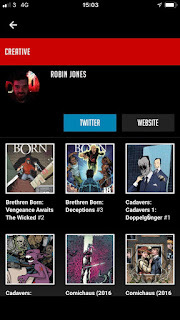 Whilst on the Robin Jones page I thought I’d check some his work so I selected Comichaus #7. This is where the app shows its power and makes itself stand out in a crowd. You can read the comic there and then, within the app. I expected this and obviously wasn’t let down BUT and this the huge part for a reviewer and a huge part for a possible new fan of a title that wants to more. Dates, publisher, format reviews, opportunity to buy physical version, ability to save offline and read later are all at the top of the page. Every conceivable thing I thought I wanted to do or know is there, within my fingers reach. Oh hang on, I want to see Who was involved in the comic, what day and age the stories are set in, whether it’s suitable for my children to read, and just how much Robin Jones influence is contained within how many pages? This you don’t get on Amazon. This you rarely get on Titan or Waterstones or even the ‘big two’. Here on Comichaus at the bottom of the selected page is a section for everything and everything in its place. Want to know who lettered a project? Press Letters (it’ll be Robin Jones, it’s always Rob), want to know if the contents are suitable? Hit Explicit. In this case it’s for a mature audience, but there’s stuff that say Teen or Not Explicit so like with your television and film choices you can see whether a particular title is suitable for one of your kids. This is especially important for me as I have 5 kids ranging from 5 to 19 so before I recommend or buy a title I’m forever trawling Google to find out its suitability. I’m not sure how this app hasn’t happened before, I’m not sure how much money and time went into its development, I’m not sure how the hell we lived without before. I am sure that you need this in your life. Avid comic fan? You’ll find everything and everyone you love. Newbie? 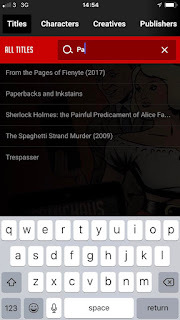 Take a punt on a top title, use the search options and hit something that sounds cool. Reviewers? 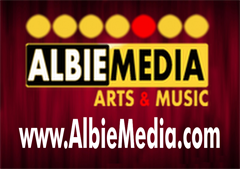 Name an indie artist, writer, letterer, small press; they’re all there. 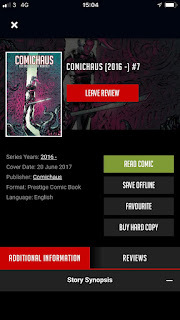 Alterna, Madius, Ken Reynolds' excellent Sliced (Quarterly) they’re all there and we can add our reviews to the title helping not only people make an informed decision but it shows the world that our fingers are on the pulse of all that is cool. There’s a couple of glitches I noticed, Ken Reynolds is listed twice, but overall the simplicity and beauty is unparalleled. 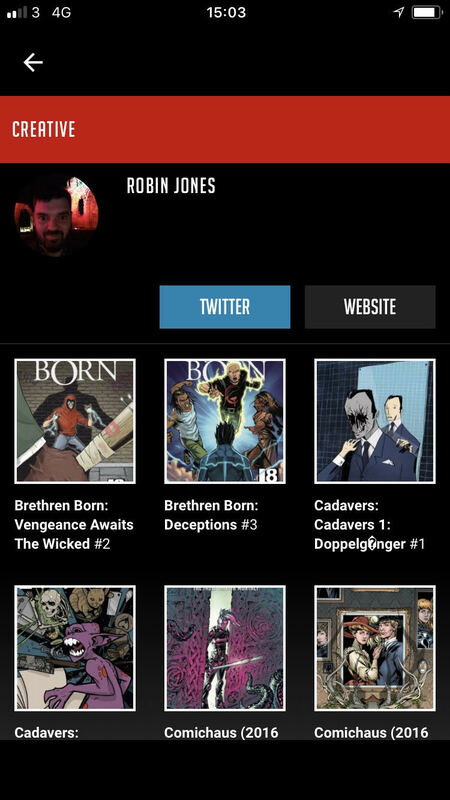 Having spoken to Pete at Comichaus I can tell you the Beta version of the app goes live to the public on November the 21st. 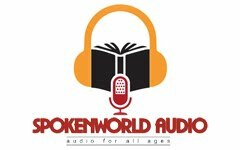 You can sign up here http://www.comichaus.com/app and be notified as soon as it’s live. There is also a few bits to add and update in January, but that’s usual for any app. 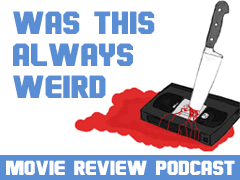 This honestly is a world changer of an app, it’s also easier to use than say iTunes, and more user friendly than Netflix. 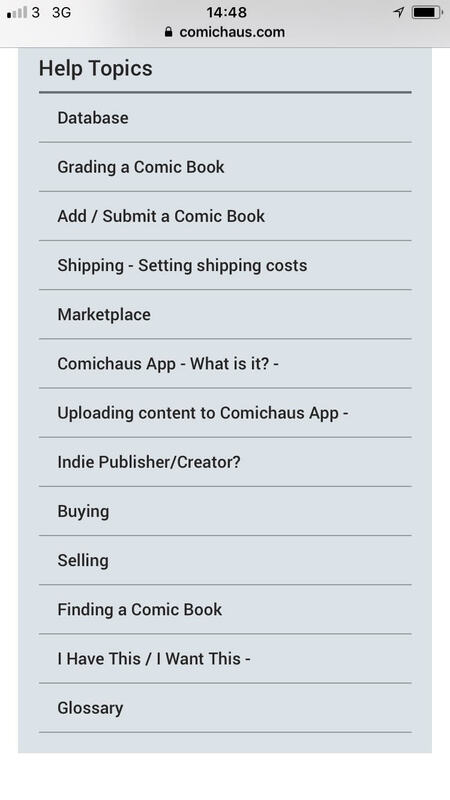 As the comic world grows so will Comichaus and for £3 a month (£30 a year) you can access hundreds soon to be thousands of titles, save offline as many titles as your device storage will allow, and you can feel charitable and show off to friends and family that support the arts as Comichaus split any money and revenue with the creators. All images and screenshots reproduced with the permission of Comichaus.